Here's the place to report bugs, errors with other mods etc. NOTE: Only report issues here if you use the latest version of TSLRCM (1.8.5). If you don't, please update to the latest version of TSLRCM! They very well might resolve your issue. When posting an issue, be able to state with your issue the following information (stolen from a wonderful post by Darth InSidious) . . . which I've amended. Include these questions with your answers, please. This is now a requirement for bug posting. Thank you for your continued patronage.
) When did the problem begin to occur? 6) Did you use the TSLPatcher, if provided? 7) Were there any errors in the TSLPatcher installation? the Battle for Telos and after i have talked to Manalore and Visas and saying I am ready to board the Ravenger the normal cut scene will play and then a scene will play with a republic ship and the Admiral will walk forward to the front and the game keeps running but nothing progresses from there other than the Republic troopers typing into consoles pointlessly. There is still some issues with the lip synchronization in the cutscene that plays when you land on Korriban for the first time, plus, the problem with the broken camera angle durning your conversation with Kreia (Asking about details of what happened in Korriban) continue, I guess it happens only with widescreen users. I did a fresh installation of the game and put the 1.8.5 right after it (Steam version). PS: Don't forget to correct the lip synchronization to. After I uninstalled and reinstalled 1.8.5 after I was told that this would fix some gameplay bugs. Now there is no music at all even though the music volume is set to default. The music just doesn't play. Even on older saved games. Does uninstalling 1.8.5 and reinstalling it count as the latter option? Today when I tried to start a new game. No music at all. The music files all seem to be in the folder. I already did that for previous bugs. Is the music volume above zero? Yes. It definitely was when I looked at it. But now that I've tried uninstalling and reinstalling the mod again, I'm getting the "This Game Needs Steam" thing and it refuses to launch. Either that OR it says this game is now launching, I get the yellow popup about how the game is in administrator, then it goes back to the Steam launch, the yellow pop-up, repeat. It never launches. I cannot trigger Keira's "Kreia, what are you - are you a Jedi, a Sith?" back story conversation even with enough influence is gained. I'm on Telos and I've passed the conversation that starts with "Do you know anything about the Sith who pursue us? ", yet I cannot get the "Kreia, what are you - are you a Jedi, a Sith?" conversation to show up with the mod enabled. If I start the game without the mod enabled (subscribed in Steam Workstop), I can see the option. If I start with the mod enabled, I can't see that conversation option even on a save that has already passed the check and done the pre-rendered cutscene. Whenever the TSLRCM 1.8.5 mod is enabled. Yes. Steam auto-updated and I verified the local game cache on each computer I tried it from. No, it was a fresh download for both the game and then the mod. No previous versions installed. No, installed with Steam Workshop. Happens continuously. I tried zoning, completing other quests, and so on and I still don't see the conversation option. Yes, all saves affected whether they were previously modded or un-modded. Yes, I started a fresh game with the 1.8.5 mod and I couldn't get the conversation option to show up. Tried in both Windows and Linux (both via Steam). Issue acts the same on both. Thanks. I can confirm that the conversation shows correctly with TSLRCM enabled once Telos is cleared. I'm just used to doing that conversation first thing on Telos as in the unmodded version. @ casferas: That's a mod-conflict, so fairly sure your "no other mods" isn't accurate. Which mods do you use? @ guibaesa: Never had that Goto issue, and since I do Nar Shaddaa first he's always there. Can't really do much about the lipsync. @ lumilara: As goat stated, intentional fix. No we're not, since it's a modconflict, not some thing wrong in TSLRCM. I'll do a fresh reinstall on my laptop and see if anything comes up. Well, I'm feeling up for a game of Devil's Advocate today. Squall or Goat: Send me a save with the clone being there and I'll check a few things out. We've already established it last time around both were using a mod overwriting TSLRCM's a_makejedi.ncs. No mystery here. I've made it up to the Harbinger in trying to get off Peragus. Everything has worked fine so far, except for the Sion confrontation. 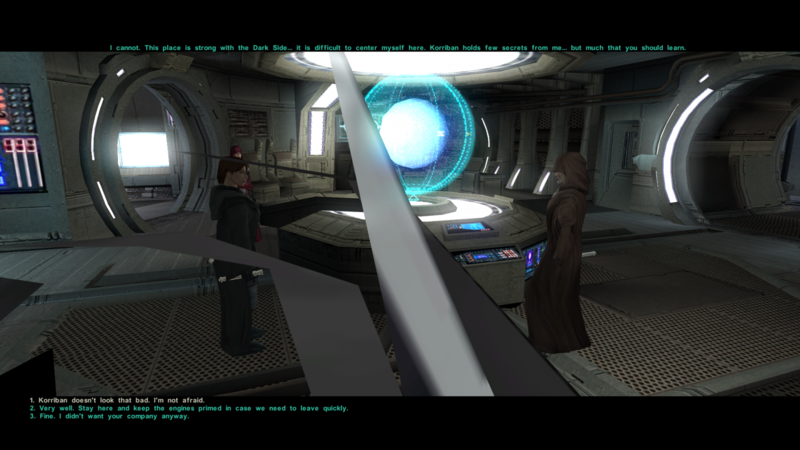 I enter the area, Atton gets a bad feeling, I trigger the cutscene, Sion walks up and says "I have come for the Jedi". He's... Supposed to say something else, isn't he? Something like "I have come to warn you Jedi you know not the path you walk" or something similar. It's making me nervous that if keep playing I might miss some of the other restored content. 1) When did the problem first occur? upon triggering the Sion cutscene on the Harbinger. 2) Did you install the latest version of the more? 3) What version of the game do you have? 4CD I believe it's the US version. 5) Did you install this over the previous version, or did you perform a fresh installation as required by the TSLRCM's read me file? I installed it over the previous version. 8) What other mods have you installed? @ Tomato: His line is gender-related.